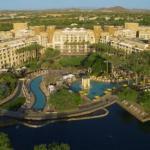 The SOAP 51st Annual Meeting is organized by Society for Obstetric Anesthesia and Perinatology (SOAP) and will be held from May 01 - 05, 2019 at JW Marriott Phoenix Desert Ridge Resort & Spa, Phoenix, Arizona, United States of America. The Meeting is intended for anesthesiologists, obstetricians, neonatologists, obstetric medicine specialists, maternal-fetal medicine specialists, residents, fellows and medical students. The Society supports the attendance by associate members in the educational sessions of the annual meeting. The program is generated from member requests and an assessment of need by the Program Committee. Attendance at this meeting does not guarantee competency or proficiency in the performance of any procedures which may be discussed or taught during the course. The American Society of Anesthesiologists designates this live activity for a maximum of 34.25 AMA PRA Category 1 Credit™*. Physicians should claim only the credit commensurate with the extent of their participation in the activity. This meeting is dedicated to Improving Maternal Outcomes: High Impact Strategies for Change, bringing you the latest techniques, guidelines and research. The pre-meeting workshops offer great opportunities for skill building for any level of training. Hands on workshops feature a wide array of ultrasound applications, professional development in leadership, and team training! Dr. Carolyn Weiniger will deliver the annual, highly anticipated “Gerard W. Ostheimer – What’s New in Obstetric Anesthesia?” lecture and Dr. Jose Carvalho will be giving the always engaging Fred Hehre Lecture. Emerging research will be highlighted in our Gertie Marx Research Competition, Best Paper Session and oral poster presentations. New this year, we present several multi-disciplinary panels to discuss the coordination of care for some of the sickest patients. We will have a special guest appearance by Stephanie Arnold, bestselling author of the book “37 Seconds” about her personal experience with a near fatal amniotic fluid embolism. For those looking for brief, clinically focused, refresher lectures, join us Saturday, May 4th for the Clinical Track. These lectures feature 25-minute overviews of how to treat pregnant patients with Maternal Hemorrhage, Substance Use Disorders, Postdural Puncture Headache and Controversial Topics with Emerging Data. Trainees can take advantage of our “Find a Mentor” program where residents can pair with more senior SOAP members to learn more about our wonderful specialty. CME activities may include the following formats: plenary sessions, debates, lectures, poster discussions, oral abstracts, problem-based learning, and skill-set workshops. • Elevate readiness of one’s home institution to undertake the broadest reasonable range of maternal and perinatal care given available resources and personnel.